If you have ever used two-way radios, you have probably heard of the company Midland. They became well known in the 1970s for making CB radios, but have kept with the times and now produce many high quality communications products, including Midland Two way radios. With over 50 years of experience under the belt, it’s no wonder people have come to know and trust the Midland brand. In fact, that’s why I got my hands on some Midland two way radios. I’d heard of the brand and have even used a couple of their radios for personal use. But, I wanted to really dive into the Midland brand, take a detailed look at several of their radios and see which one came out on top. To get a good feel of different two-way Midland radios, I put four different models through a series of tests and use cases. I tested a radio from the X-Talker line, two radios from the GXT line and a model from the LXT family of radios. 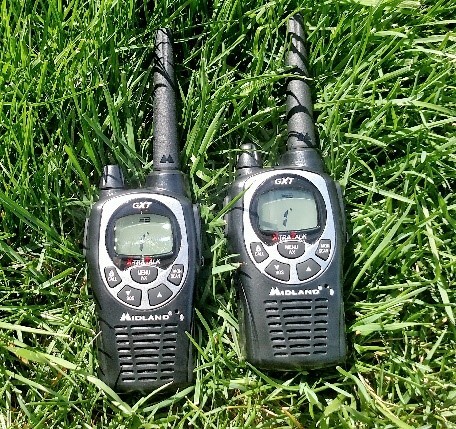 After taking a look at all those radios, the GXT1000 came out on top as the best overall Midland two-way radio, for several reasons. First, with a range of 36 miles this radio lets you communicate over some incredible distances. I am an avid outdoorsman, so I also really like that this radio is water and weather proof. The GXT1000 also has a ton of channels, has great power and a host of other features. I was also impressed with the price tag, especially considering everything you get with this radio. For less than $100, you get an extremely capable radio with a ton of extra accessories. All in all, it will be tough to find a better Midland radio for this price. In fact, it would probably be difficult to find another two-way radio from any manufacturer with so many features at such a reasonable cost. Coming in at a very close second is a “cousin” of the GXT1000, the GXT1050. The GXT1050 is made with outdoor use in mind. It has many of the same features as the 1000, including great range, water and weather proof and plenty of channels. The 1050 comes with a mossy oak camouflage design and has the ability to produce animal calls along with silent operation and a vibrate alert, all of which are perfect for hunters. Ranking third after my tests is the X-Talker radio. It is a little less than the two GXT models but doesn’t have as many features or included accessories. Where it did shine nicely was range, which at 38 miles is a little more than either of the GXT radios. The X-Talker would probably be a great, every-day radio for home use or for around the neighborhood. 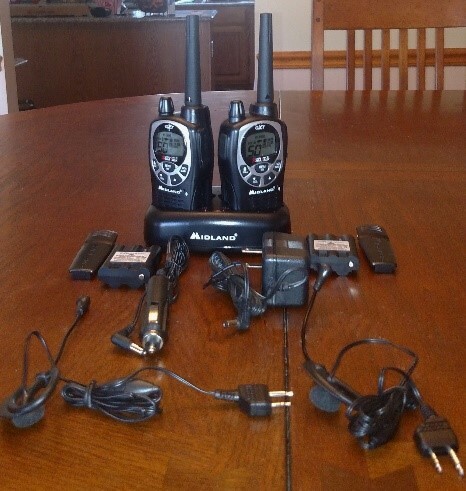 Rounding out the radios is my choice for the best Midland two-way radio for anyone on a tight budget or who doesn’t need all the bells and whistles of the other radios. That radio is the LXT model. The LXT features 22 channels, a range up to 18 miles and some other features that make it a solid radio. Plus, the price tag is just a little over $30, so this radio is perfect for anyone that does not want to spend a lot of money, but still wants the peace-of-mind and security of having a reliable two-way radio. · Why does my opinion matter? · Who else likes my #1 pick? · My #1 pick · What other brands are out there? If you find yourself asking why you should take my opinion into consideration when looking for the best Midland two-way radio – I don’t blame you. I would be skeptical at first, too. But, hopefully after you read a little further you will see I have the experience and knowledge to provide valuable information in this article. I mentioned earlier I am an avid outdoorsman. When I’m not working, I’m outdoors with my family. Camping, hiking, boating, fishing or just playing fetch with our dog. One way or another, I am outdoors a lot. 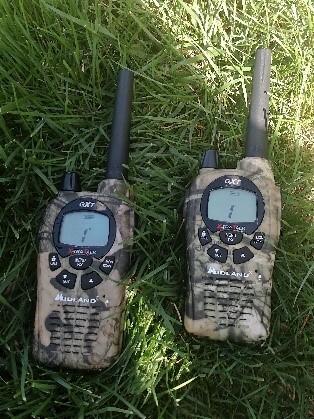 Whenever we are outdoors, we always have two-way radios with us. Because of this, I’ve been using radios for years…and I’ve tried several different brands and models. I also like to use a two-way radio to keep track of my kids when they are playing in our neighborhood. Giving them a radio to take with them means I have instant communication. Plus, I don’t have to worry about them losing or damaging an expensive cell phone. 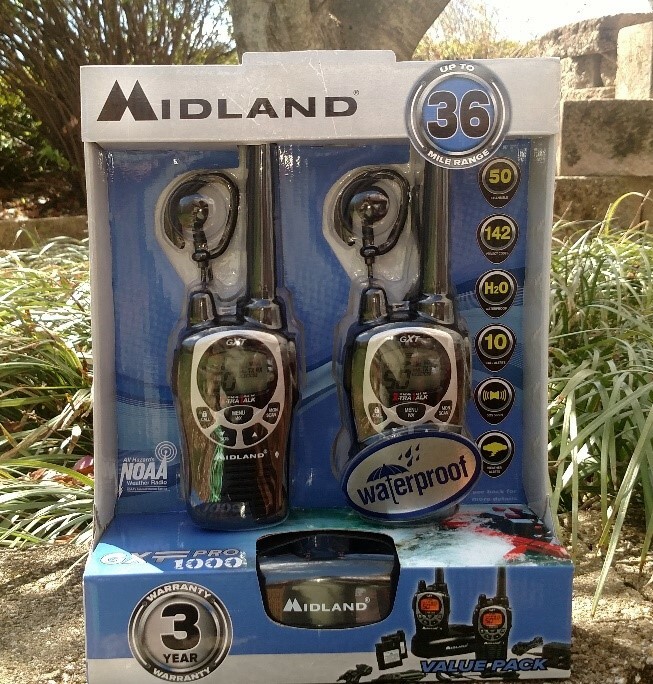 Two-way radios, especially ones from Midland, are very rugged and durable. Lastly, I’ve worked in the communications industry for over 20 years. I’ve been part of organizations that build communications from the ground up and are spread out over large distances. Two-way radios have been a mainstay in every organization and project I’ve been part of. In other words, I have a lot of experience using two-way radios in a wide variety of environments and circumstances. Two-way radios have become very popular because they useful in so many different scenarios and situations. Plus, they are incredibly easy to use. So easy, in fact, that children can easily use them. After all, it doesn’t get much easier than “push to talk”, right? Because these types of radios are so useful and simple to use, this article is meant for anyone that is curious about the benefits of two-way radio communication or that wants the right information to make an informed decision before buying a certain product. There are some specific people that would benefit from using a two-way radio. For example, if you enjoy the outdoors like I do, a two-way radio is an excellent way to keep communications with a base camp or your family, particularly in the event of an emergency. 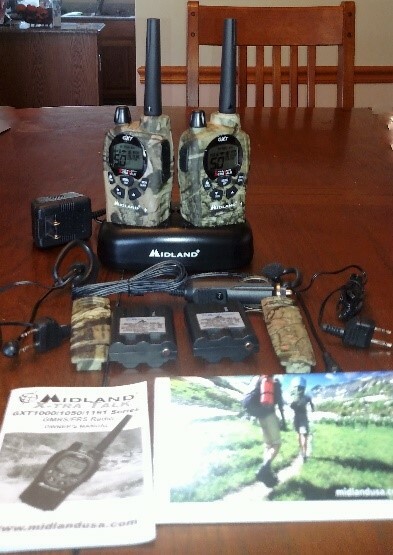 A Midland radio could be very useful to a couple of hunting buddies, especially if the radio that you use for hunting has the ability for whisper quiet communication or a vibrate mode, like you will find on the Midland GXT1050. Parents of kids can also benefit from reading this article. As I mentioned earlier, I use two-way radios to help keep track of my kids when they are running around the neighborhood with friends. The batteries last a really long time, can be recharged and you don’t need an expensive data plan to use them! Take my word for it, there is definitely a feeling a comfort with the ability to reach out and instantly communicate with your kids. These radios are also handy as part of an emergency preparedness kit or bug-out bag. Cell phone towers are known to be down or useless during a natural disaster or emergency situation, so two-way radios from Midland are a great way to have communications without worrying about cell phone signal strength or availability. Hopefully you can tell this article is intended for just about everybody. There are so many situations and scenarios where a Midland two-way radio is beneficial, there aren’t very many people who couldn’t gain some useful information. So, thanks for reading along so far … the best is still to come! Sitting down to test and then write about two-way radios was an easy decision since I have used them so many times in so many different situations and environments. I’ve also looked at other brands before, and although I’ve owned Midland radios for personal use, I hadn’t been able to test different Midland radios to see which one was the best of the best. To get a good mix of radios, I wanted to make sure I looked at models from different lines. This helped to get a good variety of options and features, and also gave me the opportunity to look at what scenarios would be best for a specific radio. Earlier I mentioned Midland had grown into a company that makes well-known and well-respected radios, so the decision to test and review their radios was not a difficult one. The first step was choosing which radios to look at and test. I decided to start with what I know is a very durable and capable radio from personal experience, the GXT1000, which eventually turned out to be my #1 pick from the four Midland radios I reviewed. I also wanted to look at a radio that was specifically designed and built for outdoor use, which turned out to be the GXT1050. 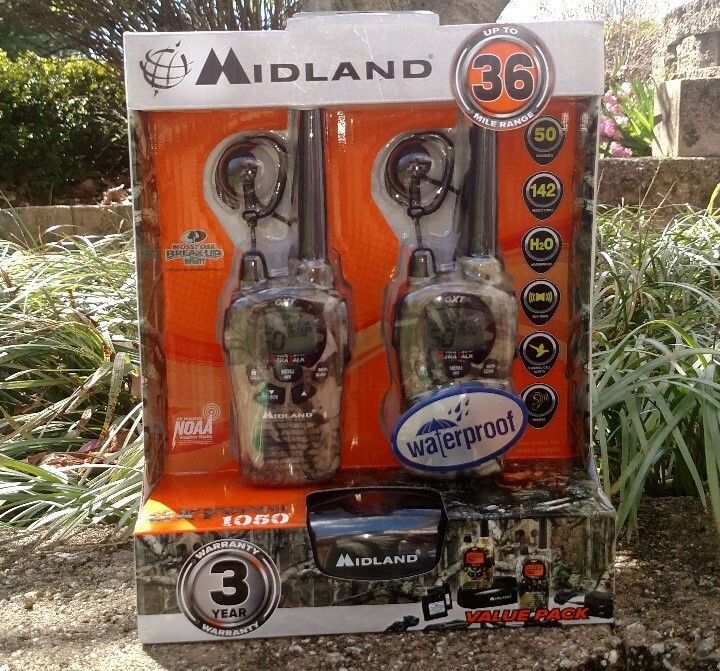 With its mossy oak camouflage design and features engineered specifically for hunters, this two-way Midland radio revealed itself to be very capable and reliable. Next, I wanted to make sure I looked at two-way radios that would be good for everyday use and in a wide variety of situations. That led me to the X-Talker and LXT radios. Both proved to be very capable, and affordable, with some nice features and capabilities. The X-Talker is a great, everyday radio. It features 36 channels and has very clear communications. I didn’t have a hard time understanding anyone when I used this radio. I tested it with kids and my wife, so I got a wide range of voices and accents (my wife is from the Southern US! ), and they all came through crystal clear. The 36 channels can also be used with 121 different privacy codes, which ends up giving you almost 3,000 different channel options. If you aren’t very familiar with two-way radios, this is a lot of channels to choose from! Why is this important, you ask? Once you’ve used a two-way radio a few times, you will inevitably run into a situation where someone else is on the same channel. Well, if you don’t have many channels to choose from, it can be difficult to find a private channel. You don’t have to worry about that though, with 3,000 possibilities. Another nice feature of the X-Talker, especially in emergency situations, is the ability to alternate between low and high power settings. If you don’t need to worry about conserving battery power, use the radio in the high power mode, and you can transmit over greater distances with increased power. But, if you are in an emergency situation where you need to worry about saving precious battery power, you can use the radio in low power mode. The range on the X-Talker is nothing short of awesome. In fact, with a range up to 38 miles, it’s actually a little better than my #1 pick. It is true the actual range of the radio depends on the terrain and if there any obstructions like hills or buildings, but that is true for any radio, regardless of the manufacturer. The X-Talker is also water resistant, so you can take it outdoors with you. But, you don’t get the weather and water proof features of the GXT models I looked at. It also includes weather alerts, so you won’t get surprised if severe weather is headed your way. It has a hands-free feature, if you purchase or have an optional headset to use with it. The X-talker comes with a base charger you can place two radios in to charge, plus a micro USB charging cable and electric outlet adapter. All of this, and all the features I just mentioned, come with a pretty reasonable price tag, as well. Now that you know a little about the radios I picked, and why I chose them, let’s go into how I tested each radio to see how they operated and how well their features worked. This is, hands down, my favorite part of the process, because I get to play with the radios, try out all the different features and see how the radios perform when compared against each other and other radios I’ve used in the past. Most of my testing was done during the course of a couple weeks, using each of the radios for several days in a row. This allowed me to see how long the battery lasted and how reliable the radios were. It also allowed me to try the radios at different times of the day and in different weather conditions. As I’ve done in other tests, I made it a point to ensure I wasn’t the only one using the radios. I had each of my family members use them, too. I even convinced one of my neighbors to help out one day when my family was off doing something else. Throughout the tests of each radio, we used the radios on different setting and tried out different features like group calls, vibrate alert, weather alerts and more. Luckily, this time of year means rain on a pretty regular basis, so I also got to try out the weather and water proof aspects of the radios. All in all, I think each of the radios went through a solid set of tests. I made sure I used the radios in the same types of situations and during the same parts of the day and night. This was to make sure I was giving each radio a fair test and to make sure I was comparing apples to apples. Alright, let’s get to the important stuff, right? 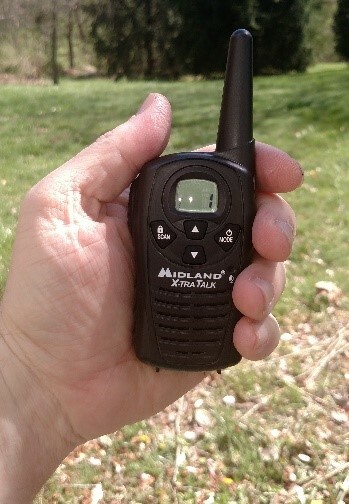 My top pick for the best Midland radio is the GXT1000. This radio pretty much has it all. In fact, the only feature this radio didn’t have was Bluetooth technology. But, it has everything else, and then some, that you would want in a two-way radio. First of all, this radio gives you a ton of channel options. This is very important to me, especially in a scenario where you want to have private discussions. I’ve used plenty of radios, especially in urban situations, where I could hear someone else on the radio because they were on the same channel I was. Well, I never had that problem with this radio. The GXT1000 has a 50 different channels to choose from, plus there are 285 different privacy codes available. Do some quick math, and you get over 6,000 different channel options. Needless to say, I did not have a problem finding a channel without anyone else on it. I was also impressed with the voice quality on each channel I used. Every channel had clear communications and I never had a problem hearing or understanding the person on the other radio. This was one of the best things about this radio. After all, it doesn’t do you much good if you have a couple of great radios, with good range and battery life, but you can’t understand the person on the other radio. You won’t ever have that problem with GXT1000. I was also fairly impressed with the range. Midland advertises a range of up to 36 miles. Naturally, the actual range depends on the terrain and if there any obstructions like hills or buildings. I didn’t have any problems using this radio around my neighborhood with the kids being a couple miles away. I also took the radios on a hike and was able to communicate with my based camp, which was well over 5 miles away. The last thing I tried was using the radio on the open water. I went out with a friend on his boat and was able to communicate with his family back at the shore, and we were easily 10 miles away. The GXT1000 also has different power options and puts out an awesome 5 watts of power, which is more than many other radios offer. This much power is how Midland is able to get a range of nearly 40 miles. A lot of times, though, you won’t need that much range. To give even better battery life, Midland provided a low and medium power option. If you select one of these power options, the radio wouldn’t have as much range, but the battery life is longer because the radio isn’t putting out as much power. I found this to be very valuable around the neighborhood when I would give one of my kids a radio. They could easily be gone all day and I never had to worry about the battery dying on me. If you are a parent, you know that type of peace of mind is priceless. I also like the weather and waterproof features of the GXT1000. Keep in mind, these radios are not weather resistant, which is a lower rating. These are waterproof. I used them outside during a rain storm and the radios held up without a problem. Midland is able to do this because the radios conform to the JIS4 standard for waterproof devices. This means the radios were put through specific tests as part of their design and manufacturing, to ensure the radio can operate in rain or if it gets water splashed on it. One of my favorite aspects of the GXT1000 is all the accessories that come with the value pack. You get an incredible amount of accessories for your money. The value pack comes with two radios, rechargeable battery packs and a desktop charger you can set the radios in to charge. It also comes with belt clips, an AC adapter for the desktop charger and a DC adapter you can use in your car. Lastly, you get a pair of headsets. I found the headsets to work very well and be extremely useful if you want to go hands free for doing yard work or anything you need to use your hands. I really liked using the whisper mode with the headsets. In whisper mode, you can talk quietly – hence the moniker whisper mode – and the person on the other end can hear you clear as day. The GXT1000 comes with a ton of other features, too. You can put it in silent mode that disables all the tones. It has a NOAA weather alert mode that automatically synchs up with your local weather station to alert you before any severe weather arrives. The radio is rugged and durable and was able to easily stand up to use from a couple of teenagers. It is easy to use, has a backlit display and works about as well as any radio I’ve ever tested. For the money, you get a ton of features and accessories, making the GXT1000 easily stand out over the other Midland radios I reviewed. Obviously, it would be nice if other people could confirm my opinion about the Midland GXT1000, right? Well, have no fear fellow reader, others like the radio just as much as I do. Check out “Top Ten Reviews” and you will see it gets a solid 9.58 on a scale of 10. In fact, it ranked third out of all the radios reviewed on that site and is four spots ahead of the next Midland radio on their list. In other words, the GXT1000 is one of the best two-way radios on the market today, not just compared to other Midland radios, but compared to all other radios. Amazon reviewers give the GXT1000 4.1 stars out of 5, with almost 2,500 different reviews. An amazing 84% of the reviews are three stars or better. It came in #4 as a car electronics accessory because of the DC adapter and was ranked #10 out of all hunting and fishing accessories. Hopefully that gives you a good idea of how many people agree with me about the Midland GXT1000. It is definitely the king of the hill when compared to other Midland two-way radios, and is even ranked as one of the best overall two-way radios available today. If you want an alternative to the GXT1000, and don’t mind spending a little more money, you should definitely consider the Midland GXT1050. This radio is very similar to my #1 pick, but is geared more towards outdoor use like hunting, so it is a bit of overkill to get this radio if you plan to use it in everyday situations. One of the first differences you’ll notice right away is the GXT1050 has a mossy oak camouflage design. This will definitely appeal to all the hunters or sportsmen out there. Another feature all the hunters out there will like is the vibrate mode. When the radio is in this mode, the radio will vibrate to tell you there’s an incoming call for you. With this feature, if you are in a scenario where you don’t want to make noise, you can squelch back to let your buddy know it isn’t a good time to talk. Want to try your hand and hunting and animal calls? You are in luck, because the GXT1050 even has 5 animal call alerts. Yes, this radio actually has five different animal call alerts. How cool is that? You can make the radio alert with a call from a turkey, duck, crow, cougar or wolf. The GXT1050 is also weather and water proof, has a range of nearly 40 miles and has over 6,000 channel options to choose from. Like its cousin the GXT1000, the value pack comes with a host of accessories like belt clips, headsets and a desktop charger. This is a solid second alternative and is also a great choice for anyone that wants a two-way radio specifically designed for hunters and outdoorsmen. If you are looking for a two-way radio and want a low cost option, then the LXT118 model from Midland is right up your alley. The radio’s range is up to 18 miles, so it falls well short of our first and second picks, but still gives good coverage. Keep in mind, as with the other radios I looked at, the range always depends on the terrain and any obstructions around you. You get 22 channels, which is also less than other Midland radios. But, for everyday use around the house or even camping, you should not have a problem finding a channel without someone else on it. All of the different channels I used sounded great, so Midland certainly didn’t lower their standards for clear communications with the LXT118. The package comes with three rechargeable batteries for each radio, plus an AC adapter so you can charge the batteries when you aren’t using it. The radio will also work with standard AAA batteries or other AAA rechargeable batteries, which is a nice touch. You can throw this radio in a bag or kit, along with some spare AAA batteries, and you will have instant communication whenever you need it. The LXT118 also has a hands-free operation mode, which I really liked. You basically use your voice to activate the radio. I could set the radio down and just use my voice to activate it and speak to someone with another radio. This might not be a feature you use all the time, but I still thought it was nifty enough to mention. With this radio, as well as with the others, you can perform automatic channel scans for activity. This could be useful if you forget what channel everyone else is on. But, to make sure that doesn’t become a problem, especially with kids, the LXT118 also has a keypad lock. You can put in your group settings for channels and other settings, and lock the keypad. This will prevent someone, such as a curious teenager who wonders what all those buttons do, from changing the channel or group setting and thus losing the ability to communicate. Since this is my pick for a low cost option, I better mention the price! How does well under $30 sound? 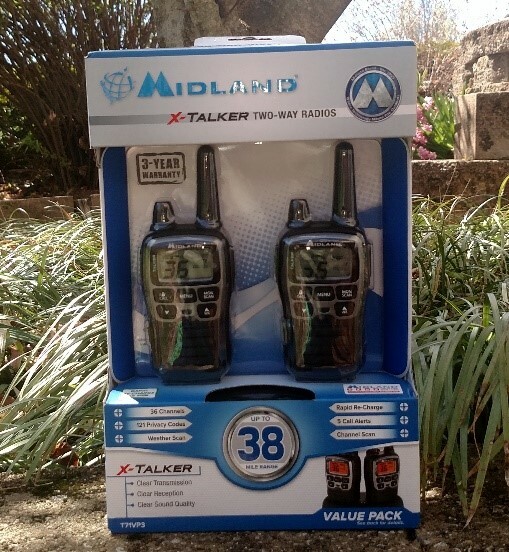 Yes, you can get a package of two LXT118 radios for less than $30. For that low of a cost, this is a very capable radio that will be great for everyday use. You can get two packs, so that you have a total of four radios, for less than what it would cost two buy two of my other radio picks. True, you do lose some capability and range with the LXT1000, but if that is okay for your personal situation, then this is a great two-way radio option for you. What other brands are out there? Midland isn’t the only maker of two-way radios, of course. There are many different makers of radios and some of them are comparable to Midland in features, range and design. For example, Motorola is a popular and well-respected two-way radio company. 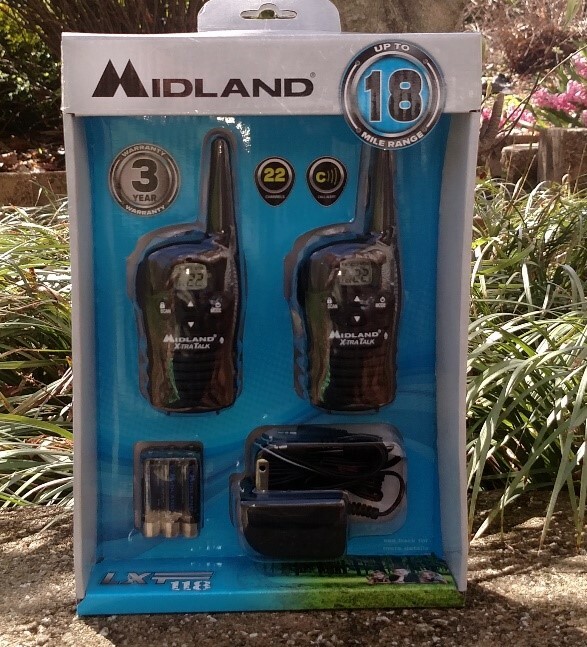 Many Motorola two way radios have the same features as what I found with the Midland models. The main difference, is none of the radios I looked at had a Bluetooth option, whereas Motorola does produce a radio with Bluetooth technology. Uniden is another well-known brand for two-way radios. They make several different models with a variety of options and pretty decent prices. By now, you should have a solid foundation about what tool look for in a two-way radio and what options and features are available on today’s market. There are other brands out there, like BaoFeng, Cobra and Amcrest. Go ahead and put your new found knowledge to good use to help make the best decision for your personal situation and requirements. Now that you’ve read through the entire article, you know my thoughts on the best Midland two-way radio available today. I ran each of the radios through the same set of tests, used them in similar situations and compared them to come up with a way to rank them and give you the information you need. After all that testing and use cases, I definitely believe the Midland GXT1000 was the best two-way radio out of all the different ones I looked at. It has great range, a ton of channel options and a host of other features. I also really like the value pack option because it comes with so many useful accessories. Coming in a close second is the Midland GXT1050, which is very similar to my #1 pick. The main differences are that the GXT1050 was specifically designed and made with hunters and outdoorsman in mind. The mossy oak camouflage design is a nice touch, as are the animal call alerts and vibrate mode. It is a little more expensive than the GXT1050, but is a nice option for hunters or avid outdoorsmen like me. Rounding out the list were the X-Talker, which is absolutely a solid radio that actually has better range than my first and second picks; as well as my low cost option – the LXT118. I hope my tests and the information I learned is able to help you decide on which Midland two-way radio is right for your personal requirements and needs. 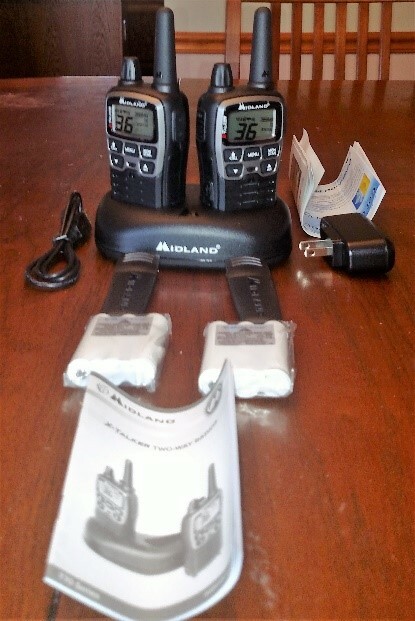 Really, you can’t go wrong with any of the four Midland radios I tested. The important thing is to find one that has the features and options you need. After all, everyone has a different situation and circumstances for two-way radio communication. Thanks for reading along and I hope you enjoy whichever Midland two-way radio you decide is the best one for you!